Southwestern International Raceway is probably not a track that most European race fans are looking to visit in 2011. And for the rest of the season, now that Nitro Jam has been and gone, there'll be little to see, save for the established (and thriving) midweek night-time and weekend bracket schedule. Nitro Jam, IHRA's only real foray into the Pro-racing ranks these days, arrived in Tucson on the Friday, and by 10 o'clock Saturday night was ready to pack up and move on to its next booking in San Antonio, Texas, where pretty much the same show will be repeated all over again save for a slightly amended entry list. Tucson was Round 6 of a twelve-race schedule for 2011. There's no doubt, Nitro Jam isn't for the purist. These are short-burst, high-intensity affairs with the emphasis on entertainment, and little depth in terms of any round-based qualifying/race/points chase structure - an inevitable consequence of the budget-driven, invitation-only nature of events. During daylight hours, local bracket racers take centre-stage with the Pro classes taking over for the Friday and Saturday evening sessions, each evening being treated as an entirely separate event with points awarded for each. I've seen US 'booked in' shows in the past and, often, any sense of 'real racing' has been sacrificed in favour of maximum fun for the casual race fan.Whilst the target audience for these events is most definitely the casual fan, my initial scepticism over the format was short-lived. The touring on-track announcer relied heavily on his ability to whip the crowd into something not far short of frenzy, with his well-drilled and scripted, patriotic 'rant' - highly formulaic, but an absolute cert if you're looking to get the crowd on your side, Stateside, from the get-go! And as far as the racing goes? So far as I could tell, this looked like the real deal. These guys didn't look like they were here just for the appearance money. They were here to race, and that's what they did. 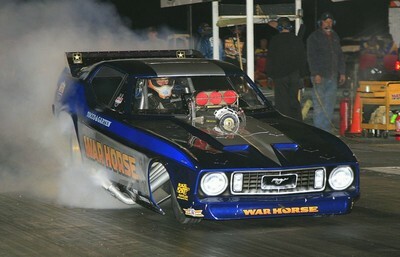 The main draw for the fans was undoubtedly Prostalgia Nitro Funny Car. With eight of the land's leading fuel coupes in attendance, two current spec Top Fuel cars, an all-Lucas Oil show featuring Bruce Litton and Bobby Lagana Jr - four each of Nitro Harley and Fuel Altereds, plus a couple of nice quick Jet Dragsters, not to mention a curious match-up between the ever-popular Monster Truck Gravedigger and Shockwave, the spectacular Shockley-operated three-engine jet truck. The Pro classes are run over two rounds, the two quickest winners facing each other in the final and a consolation race involving the two quickest losers. Effective, compact and, for the sizeable audience on both nights, a great deal of fun. Prostalgia Funny Car saw James Day pilot the War Eagle Firebird to victory on behalf long-term recovering funny car legend Dale Pulde. Day overcame Mike Savage in the Candies and Hughes tribute Barracuda with a fine 5.894/236.92 charge, to his opponent's valiant but drifting effort requiring an early shut-off close to the three-quarter mark. Top Fuel contenders Litton and Lagana entertained the fans with an impressive display under the superb SIR track lighting, Lagana taking both laps with a best of 4.975/269.29. 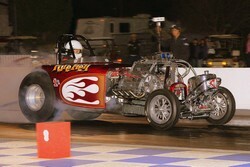 Fuel Altered provided some superb action. Four cars took to the track for Round 1, but a hard contact with the side wall following a sharp right-turn off the startline saw an early exit for Ron Maroney and his beautifully prepared and presented Super Nanook. Chris Bennett's Pure Heaven Bantam took the honours with a fine pair of passes, 6.626/166.93 and a final-winning 6.406/194.02. "Insane" is how IHRA Media Director Larry Crum described the riders of the Nitro Harleys in his pre-race release, and who could argue? Mike Scott took away the Ironman trophy for the win with a magnificent 6.867/203.89 blast into the darkness over previous points leader Steve Dorn. Following the weather-delayed March Meet the previous weekend, the trip to Tucson was just a short hop for Pennsylvania-based Peter Gallen, and the Poverty Stricken Vega continued a run of fine performances to carry off the Prostalgia Funny Car win over fellow East-Coaster Mike McIntyre in the magnificent McAttack Z28 Camaro. Gallen's 5.777/250.97 effort, to McIntyre's very close 5.808/232.39, won the team a new ET record for the class and with it another Ironman trophy. 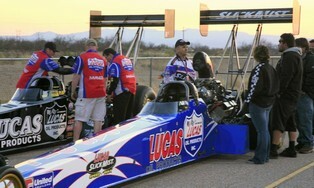 Once again it was Lagana's day, the newly-sponsored Lucas Oil car taking the Top Fuel win for the second time on the weekend with a fine 4.772/311.03. Another double for Chris Bennett in Fuel Altered, this time with an uncharacteristically arrow-straight charge for the line, completed in just 6.442 seconds at 214.28 mph. 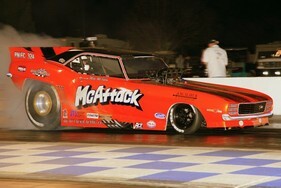 Runner-up Jason Richey, also sporting a Bantam body, completed the lap with a slower but equally direct 6.921/217.63. The boot was firmly on the other foot this time aroundin Nitro Harley, with Steve Dorn stamping his authority over the previous night's winner Mike Scott. Off the line both bikes enjoyed good clean runs, and it was a close-run thing too, Dorn taking the startline advantage with a 7.102/207.59 to Scott's 7.161/210.87.